Sergeant Charles Dankwah, a police officer with the Operations Unit of the Accra Regional Police Command, is currently battling for his life at the Korle-Bu Teaching Hospital following an attack on police officers on Saturday night. Three others also sustained various degrees of injury. The four policemen were deployed to arrest some armed robbers, who had launched an attack on some residents at Dansoman, Sukura. The others have been identified as Constable Gbedema Rudorf, Corporal Gbemu Thomas and Corporal Nyamekye. Two civilians, who heard the sporadic shooting and ran for their lives, were not left out. 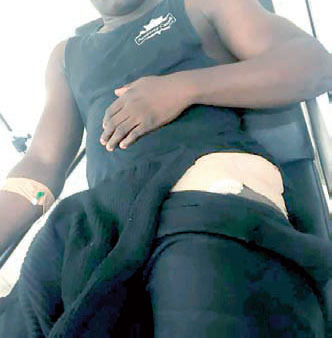 The police have confirmed that Sergeant Dankwah, leader of the team, who was hit by a bullet in the chest, has undergone surgery and is said to be responding to treatment, but the three others, who were hit in the hands, shoulders and thighs by the robbers’ bullets, have been treated and discharged. DCOP George Alex Mensah, the Accra Regional Commander, who visited the crime scene and the Korle-Bu Teaching Hospital where the men were receiving treatment, told DAILY GUIDE that the incident occurred around 11pm on Saturday. According to him, the regional command received a distress call of a robbery attack at Zamrama line around 8pm and the police officers were dispatched to the scene. On their way, the men missed the road and had to stop at an area near Sukura for direction. Unknown to the personnel, the armed robbers were hiding in the area where they had stopped. Immediately they alighted, the armed robbers, who were hiding in a wooden structure, opened fire on them. The four men, who were hit, quickly lay on the floor with the exception of the driver who was in the vehicle. The driver sped off and called for reinforcement which later conveyed the wounded police personnel to the Korle-Bu Teaching Hospital for medical attention. Two others, a 24-year-old man identified as Ebenezer Danso, aka Nana Yaw and an elderly woman, also sustained injuries. Mr Danso was hit by a bullet while the elderly woman, who was seated outside, fractured her leg when she decided to run into her room. The regional police commander, however, said no arrests have been made.